a sawyer q.v. who cuts longitudinal spars and transverse ribs for aeroplanes on circular or band saws, to to [sic] pattern provided. cuts part of bamboo furniture, etc., on circular saw, ready for bamboo furniture maker (498) q.v. adjusts or inserts a gauge, mould, or mark in power-driven band or ribbon saw, to guide wood as it passes through machine; sets machine in motion by moving a lever or otherwise; passes wood into machine, and holds it as it passes through machine, guiding it if necessary; if a skilled sawyer, sets his own saw, i.e. sharpens teeth by hand filing and with punch and hammer. cuts briar root or other wood roughly to shape of bowl and stem of tobacco pipe, with a machine saw. (ii) stands at back of machine, and receives cut wood as it leaves saw, sliding it towards him over metal table of machine. a sawyer q.v. who cuts up lengths of timber into blocks for breaster (486) q.v. a band sawyer q.v. who specialises in cutting sections of chairs; cf. chair stuff maker (486). adjusts or inserts a gauge in power-driven circular saw, regulating length and width to which timber is to be sawn; sets in motion saw, which protrudes through a slot in metal table of machine, by moving a lever or otherwise, arid pushes timber along surface of table, against revolving saw; if a skilled sawyer, sharpens teeth of saw, by hand, with a file, punch and hammer, and fixes saw, after sharpening, back in position in machine. saws timber, usually of large bulk, for use in and about mines; usually operates circular saw. general term for any person working in a mill where tree trunks or roughly hewn baulks of timber are converted into joists, planks, or other marketable shapes and sizes of timber. a circular sawyer q.v. who saws timber into cask staves on circular saw bench. cuts wood by pushing, by hand, moveable bed carrying material backwards and forwards past cutting edge of circular saw (specially sharpened to cut across grain of wood) so that wood is not splintered at edges. holds ebony wood against power-driven circular saw or band saw, thus cutting it to required dimensions and to best advantage, taking into consideration "shakes" and medullary rays; great care required as ebony is very valuable. operates machine containing a number of thin flat saws, moving up and down vertically or, more rarely, horizontally, and cutting several boards at once; set saws, i.e., sharpens them by hand, using hammer, punch, and file; sets saws in position in machine, adjusting them by hand with help of gauges according to width of timber to be cut; places or supervises the placing of timber in position to be cut and manipulates power controlling levers. pastes design or holds template on piece of prepared wood, and follows outlines of design or template with power-driven fret saw. cuts, with circular saw, slit in saw handle which receives saw blade. a sawyer q.v. 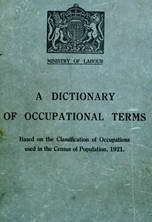 who cuts lengths of well seasoned wood on a circular saw, and lays them out in stacks, ready for cooper (477) q.v., in making heads, i.e., end pieces, of casks or barrels. a frame sawyer q.v. operating a frame saw moving horizontally instead of vertically. cuts out individual keys from keyboard (on which ivory or other thin pieces have already been glued) with a hand or power-driven saw. a band sawyer q.v. working with a heavy type of band saw used for cutting logs and heavy baulks of timber. a sawyer q.v. cutting wood into specially thin boards for panels of carriages, coaches, etc. sharpens ends of pit props by sawing to a taper by hand or on machine saw. one of two men who cut up timber by hand, with a long saw having two handles; one man stands above, holding one handle, another below, in a pit. a sawyer q.v. who cut timber by pushing it, by hand, against a revolving saw, on a saw bench which has no mechanical feeding equipment. operates a saw; bench (for cutting heavy timber) which is moved towards saw by a geared apparatus called a "rack." cuts up timber, usually into standard shapes and sizes, with a hand saw or, more usually, by passing timber into a power-driven circular, band, frame or other machine saw; sets machine in motion by moving a lever or otherwise; sometimes adjusts or inserts gauge, mould or mark in machine to regulate length or width of pieces of timber to be sawn, or to guide timber as it passes through machine; if a skilled sawyer, also sets saw, i.e. sharpens teeth with file, hammer and punch; sometimes specifically designated, e.g. brush sawyer, packing case sawyer, pit prop sawyer, railway sleeper sawyer. a circular sawyer q.v. who saws up logs of cedar wood into blocks and these into "slats," or rods of the length of six pencils; cuts up slats into pencil lengths, using a circular saw. marks pattern of stick required on a block of wood, and cuts shape out with band saw. a cross cut sawyer q.v. using a cross cut saw suspended and driven from above, which is forced to and fro across material to be cut. a sawyer q.v. who squares off timber with a swing saw; cf. timber squarer (498). a frame sawyer q.v. operating usual type of vertical frame saw; cf. horizontal sawyer. cuts wood down grain, using a very narrow tapering rip saw with hook teeth, worked by one or two men. a circular sawyer or a frame sawyer q.v. who cuts planks into blocks for use in flooring, with a circular or frame saw. a circular sawyer q.v. who cuts logs to prescribed lengths, convenient for manufacture of wood pulp (for paper making) by means of a large power-driven circular saw suspended above logs in a counter-balanced arm; pulls down saw, by a handle, into contact with log, which rests on a bed or over a pit, and switches on power-drive.